It's hard to relax or have guests over with your dog jumping on everyone. With small breeds, having them jump around your ankles is annoying, not to mention a tripping hazard. Let the big boys and girls jump on you, and it's a whole other ballgame! Your 20-lb. Labrador Retriever puppy excitedly bounces up on your legs, wagging his cute little tail, obviously delighted to have you home again. He starts his adorable "happy dance" around you, spring boarding off your legs every two seconds. And those puppy eyes! Unable to hold yourself back, you bend down and pet him, maybe even pick him up for a hug. Then you have an idea. I'll teach him a new trick! It'll be so cute. "Rebel, c'mere... good boy, up, up! That's it, give me a hug... put your paws up here. Good boy!" Your 80-lb. Lab slams into her knees, and quickly jumps up with his dirty paws on her waist and new blouse, nearly knocking the life out of her, and most definitely knocking the life out of the casserole. It sails through the air, only to crash land at your horrified spouse's feet. Sound familiar? Before we show you the solution to dog jumping, you need to fully understand what is wrong with your dog jumping on people. A dog who jumps on humans is not respectful of them. 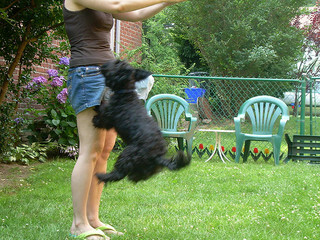 To be fair, most people inadvertently teach their dog to jump up, but more on that later. Even with small dogs, jumping is a safety hazard. 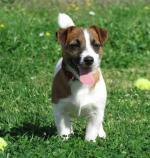 Little dogs especially can get underfoot, easily tripping someone. They can put runs in nylons, and knock over or scare small children. Large dogs can knock over anyone - children, adults, elderly. Their nails can scratch, they can knock hot drinks out of hands, and let's face it - no one really enjoys having a huge dog jump on them (especially when it's not yours!). So how do you stop your dog from jumping on people (including yourself)? 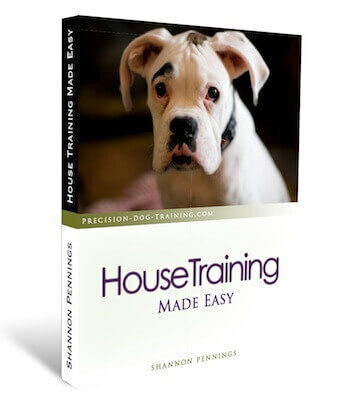 What steps should you take to start dog behavior modification? The first thing you can do is stop doing shake-a-paw with your dog. This trick, while seemingly harmless, is something that you should not encourage your dog to do. Over time, your dog will start offering their paw before you (or your guest) even asks for it. You don't want him to become a liability. Just think - he could knock a hot drink out of someone's hand, scratch or knock over a young child, or scratch an elderly person. AND, shake-a-paw can easily turn into jumping. A dog can't understand why he's allowed to have his paws on you for shake, but not have his paws up on your feet or knees while jumping. It's all the same to him! Like I always say, training has to be black and white for a dog, no grey areas. If you don't want him to jump, he should not be allowed to have his paws on any part of your body at any time. Secondly, never pet your dog when he jumps on you or puts his paws on any part of your body. You are inadvertently praising him and reinforcing that behaviour when you pet him or say hello if he jumps on you. Same goes for your guests. This means that your dog should not be allowed to jump up onto your lap on the couch, too! In fact, I always recommend making the couches, chairs, and beds off-limit for the dogs. Give him a nice cushy bed on the floor or in his crate. He'll be just as happy, and you will avoid many issues that can come from allowing the dog on the furniture. These two things will get you started on your way to stopping dog jumping. Be consistent - remember, you need to catch your dog in the act of jumping and correct it at least 90% of the time in order for him to stop this behavior! 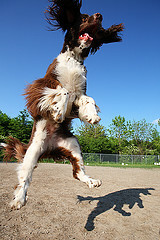 Ready to get into the nitty-gritty details of how to correct and stop your dog from jumping? We've laid out an easy to follow "road-map" for you to get started on right away. This problem will be a thing of the past in no time with some dog training help!